Each fall, our sixth grade students attend a three-day program at the KEEP center in the mountains of Kiyosato, east of Tokyo. 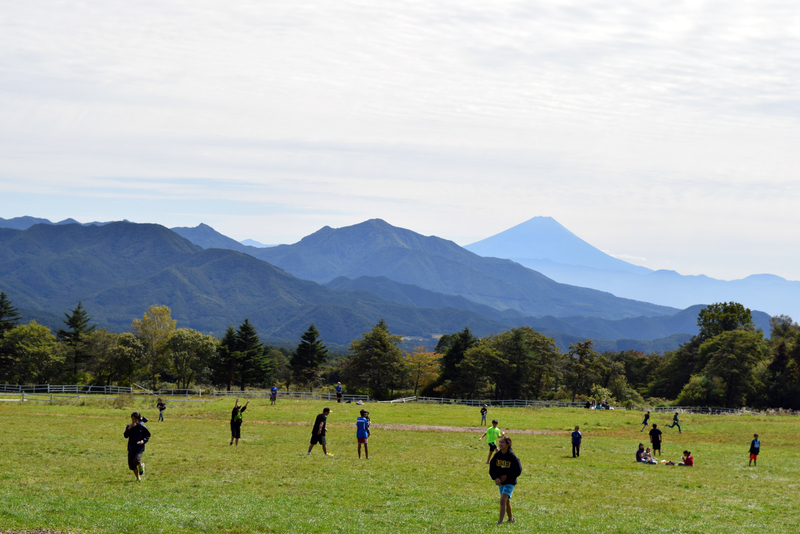 KEEP, which stands for Kiyosato Educational Experiment Project, is a recreational complex set in dairy farming land among the Japanese Alps, with sweeping views of Mt Fuji on cloudless days. This year, their trip started on September 30 and students came home on October 2. Sixth grader Olivia gives us the inside scoop on the Middle School KEEP trip. On the first day of KEEP we arrived after a three-hour bus ride. We pulled up to the entrance in the sun, but realized how much colder it was in the mountains. Mt. Fuji was there, smiling upon us in a warm greeting. We received our instructions about the Gorge Hike. On the hike there were so many worms! We heard a lot of screams as people discovered them under their feet. It was beautiful and everyone had fun. At the main viewpoint of the Gorge, we saw beautiful waterfalls leading into a vast river. We enjoyed some delicious organic ice cream before meeting our roommates and settling in. We were awakened at 7:45am. Too early for me. To my surprise and delight, breakfast was a delicious buffet. This made me more than happy. After breakfast we went to milk cows. My happiness turned to fear. When we got to the farm we had to dip our feet in disinfectant and clean our hands. Then we wrapped plastic bags around our feet, so when we stepped in the cow dung our shoes wouldn’t track it everywhere. Milking the cow was sort of disgusting—warm, soft and wrinkly. I normally like farms, but cows were not my thing. Most other students seemed to enjoy it and were quite good at it. Next up…a nature adventure! Some of the students translated because the guides only spoke Japanese. We were assigned a guide and two helpers from the Philippines to help us observe, learn and hike the nature trail. The guide hid fake animals in their natural habitat and we had to find them. It was a good time despite the rain, cold and fog! The night hike that was planned was canceled because of all the rain, but then we were surprised with a spontaneous talent show led by the students, which was very entertaining. We had dinner with our roommates before heading to bed, but we may have stayed up a little later than we should have. We woke up relieved to see a beautiful sunny day for our last experience at KEEP. We were so fortunate to see Mt. Fuji one last time. We needed to pack and straighten our rooms up before we headed out on another nature adventure. This one happened to be my favorite. We walked through the forest and were assigned groups of mixed gender. Each group built a fort with sticks, leaves and anything natural. It was really fun making the fort. Even though ours was obviously the best, it wasn’t an activity about competition. After trekking back we had some time to shop for ice cream and souvenirs before jumping on the buses to head home. We got lunch at a rest stop. I had soba for the first time. On the way back we watched the Disney movie, UP.